Fence PostsGarden TrellisIf you bought more traditional fence panels and would like to make them look a little more contemporary or want to add a design flourish, there are several options. Or perhaps you have tired old panels that you'd quite like to freshen-up, we have some ideas for you too. Adding a wooden arch to separate sections of your garden or to create a feature in a pathway, is a great way to freshen up the style of your garden. But the choice can be a little overwhelming, here we list our top 5 to help inspire your selection. 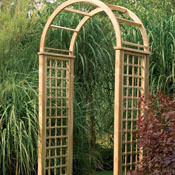 This is a tall and elegant arch featuring a domed top which would look amazing once your climbing plant have grown over it. All the timber carries the FSC mark and so you can be sure it has come from a responsible source. 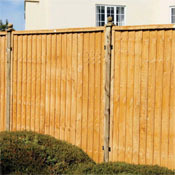 Once you've picked your fence panels you will next need to choose a suitable wooden garden gate. Similar to fencing panels, we have a range of contemporary and traditional gatesas well as different sizes. You don't have to choose a matching gate,often you can add a design flourish with an alternative gate. We often overlook our garden fencing, often opting for the most uninspiring and traditional fence panels. But it doesn't have to be that way. By choosing a contemporary or decorative style of fence panel you can dramatically change the feel of your garden. It's also possible to use trellis topped fencing to break up your garden in to defined sections, or to hide an unsightly garden shed / compost heap.